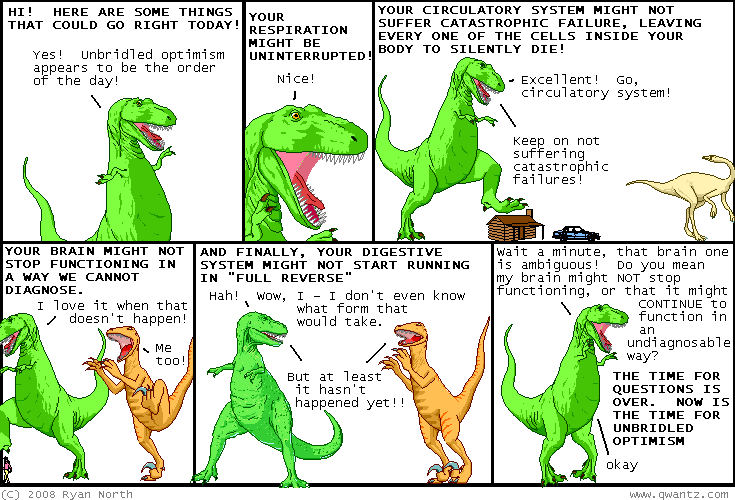 Dinosaur Comics - April 22nd, 2008 - awesome fun times! –This is not the person I thought I was! April 22nd, 2008: ROFLCon is this weekend, April 25th and 26th! I am looking forward to it and also how it is going to be insane. The schedule of events is here. Also the to-do list shirts are in and will be going out in the next few days! One year ago today: followed up by t-rex's "Sherlock Holmes and the Case of the Cat Who Ate a Person", and the more educational "Sherlock Holmes and the Case of The Troposphere Is Where Weather Exists."